By donating I can give something back to the community. Platelets are vital for the treatment of certain types of blood disorders, especially cancer. Blood donor Colin Waite explains how he became a platelet donor. "Ten years ago was when I first saw an advert about the need for platelet donors. I had given my first whole blood donation at the age of 18 and after six donations I decided to swap to platelets," says Colin, who lives in Bristol. There are only a small number of ethnic donors and I'm proud to be one of them. Platelets help the blood to clot, and are given to many different kinds of patients. But with just a five-day shelf life, donors like Colin are always needed. 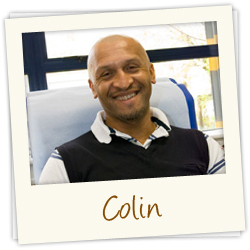 "The first step started at the next blood session I attended," Colin explained. "Along with the routine blood samples another sample was taken to measure my platelet count to make sure it was high enough." Colin got the green light and now donates as often as he can at our Bristol donor centre. "I currently work shifts so find I have the time to give platelets on my days off. It's very convenient for my lifestyle." I bring a book and my Nintendo DS to help pass the time. A platelet donor donates on a cell separator machine and is on it for up to 90 minutes. During the donation, donors can watch TV, DVDs, read, make calls from their mobile phone and use their laptop. Colin said: "I bring a book and my Nintendo DS to help pass the time, but often I just chat to the nurses. I find staff at the sessions very friendly; you get to know their names and faces when you visit them so often. What happens? He now takes platelet donation in his stride. "It's like giving blood - the booking-in and confidential health check are the same. The only difference is that I can't give platelets if I have taken aspirin in the last five days or a non-steroidal anti- inflammatory drug (NSAID) such as Nurofen, in the last 48 hours." You can choose to have a local anesthetic to numb the area before the needle goes in. "You can choose to have a local anesthetic to numb the area before the needle goes in. The staff offer drinks and refreshments. They always ask me to tell them if I start to feel different so they can adjust the settings on the cell separator machine. I know when my donation has finished because the machine beeps. Then the nurse takes the needle out and it's all over." Typically, a platelet donor would expect to give 400ml - 600ml of straw-coloured liquid, enough for two or three adult doses or eight to 12 infant doses of platelets. "Giving blood doesn't cost anything and I feel that by donating I can give something back to the community. There are only a small number of ethnic donors and I'm proud to be one of them," said Colin. Have you been inspired by Colin's story? See if you can donate platelets. Have you given or received blood, organs, platelets, stem cells or tissue? Donate the bone that's removed during the operation.